Yeah, but: It cuts stuff--is anything else about it important? The Long Version: This Remington pocketknife is very small at only 5 3/4 inches open, but poses less of a 'grip' problem than other small knives due to the rubber coating on the handle, which I believe was pre-printed in the camo pattern before it was applied. 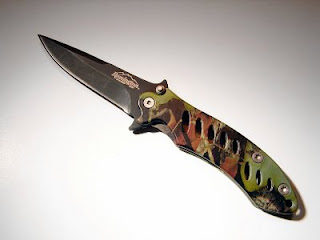 Larger knives in this series have partially-serrated blades and pocket clips. I would have hated the former but welcomed the latter. All are between a $15 and $20 retail, so I was surprised at the high quality you get with these inexpensive tools. Opening is a one-handed but two-stepped affair, with the blade started out by pressing on the serrated fingerguard then flipped open easily with the thumb button. The first step gets you past a ball-detent's resistance, which is a smart little detail that holds the blade securely in the closed position. The liner lock is actually a bent part of the back side of the handle, and while it's stiffness makes closing the knife a two-handed affair, it also simplifies construction and makes the knife extremely solid when locked. The black phosphate blade finish (also called Parkerizing) is attractive and durable, as are the Torx head screws that put it all together. I'm also fond of the blade's shape and the added safety of the finger-guards. It's a nice little knife. I may get a bigger version for more serious jobs now that I know how well-made they are.